Boss Track Attack – going on NOW! DEARBORN, Mich., Aug. 11, 2011 – For new 2012 Mustang Boss 302 owners, the unique chance to take part in a “track attack” is now a reality. As part of a complimentary program offered by Team Mustang and Ford Racing, instructors at the Ford Racing High Performance Driving School at Miller Motorsports Park are offering all new 2012 Mustang Boss 302 owners a chance to learn what their car is capable of over the surface on which it was born – the racetrack. The Boss Track Attack provides owners with a full immersion into the Boss experience, with driving instruction and extensive track time with professional instructors. 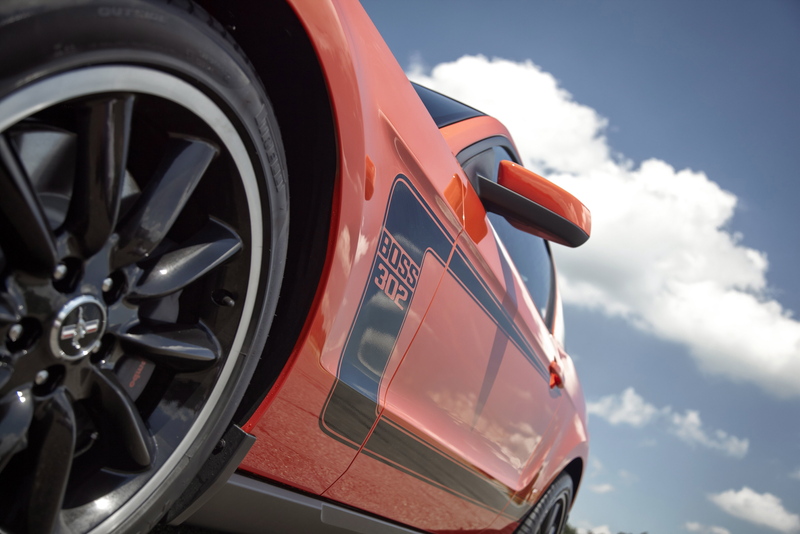 The intent is to enable Boss 302 owners to learn just how capable the new car is, and how much fun it can be on one of the country’s greatest tracks. Boss owners need not bring their own cars. Miller Motorsports Park has a fleet of track-ready Boss 302s on hand for this driving experience. The one-day experience begins with a private reception and dinner the evening before at the Larry H. Miller Total Performance Museum at the track, where participants and guests will be immersed into the history of the Boss nameplate. They will be given behind-the-scenes access to some of the stories behind the development of the Boss 302 and will get a private tour of Larry Miller’s amazing personal collection of high-performance Ford and Shelby vehicles. The next day, owners will start with a dynamic classroom session with school instructors, then spend the rest of the morning learning car control, cornering, braking and vehicle dynamic techniques, before breaking for lunch in the track’s clubhouse. The afternoon session features more on-track driving including lead and follow exercises, instructor ride-alongs and hot laps with professional drivers. The day finishes with participating owners receiving a special graduation pack from the team. 2012 Mustang Boss 302 owners can now register for their complimentary Boss Track Attack sessions slot at http://www.bosstrackattack.com or by calling 435-27-SPEED. There are 15 individual sessions available between now and the end of the year. Every owner has a year from receiving his or her car to take advantage of this program. Dates for sessions in 2012 will be determined in due course and communicated via the website. Participants can, at their own cost, attend a second day of the driving school or bring a guest to attend with them. Complete information about the program is available at the website. Ford Motor Company, a global automotive industry leader based in Dearborn, Mich., manufactures or distributes automobiles across six continents. With about 166,000 employees and about 70 plants worldwide, the company’s automotive brands include Ford and Lincoln. The company provides financial services through Ford Motor Credit Company. For more information regarding Ford’s products, please visit http://www.ford.com.